Nearly one hundred years ago in 1915, a young Dr. Forrest C. Shaklee took the initial step in creating what would become one of the first multivitamin supplements in the world. 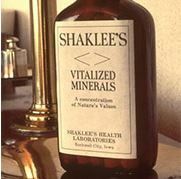 Vitalized Minerals didn’t make any headlines; only Dr. Shaklee’s chiropractic patients had the good fortune to use the product. Nonetheless, something was set in motion that would eventually change the lives of millions. With that one first step, Dr. Shaklee helped pioneer the natural health movement, which today is growing all over the world. That is Dr. Shaklee’s Shaklee Effect, and we are privileged to participate in it each and every day by taking small, simple steps that add up to a very big result. This year, at our Shaklee Live event in Long Beach, we will kick off a year-long celebration of The Shaklee Effect and 100 Years of Innovation. Together, we will reaffirm our commitment to carry on Dr. Shaklee’s legacy of innovation, to share and amplify his Effect, and to continue creating healthier lives for the next 100 years.